WOW! Women On Writing Blog: Review: Brooke Warner's "What's Your Book?" Review: Brooke Warner's "What's Your Book?" Ten years ago, I started writing a young adult novel based on a situation that happened with my daughter and athletics. I've written, erased, rewritten, revised, removed characters, created new ones. For the past two years, it's taken space on a flash drive. Once every few months, I open the file and fix what I perceive as weaknesses. Someday, it will be "good enough" to publish. After reading Brooke Warner's What's Your Book? A Step-by-Step Guide To Get You From Inspiration to Published Author, I am ready to take the next steps to seeing my words come to fruition. You can, too, if you use this solidly-written guide as a tool. Warner breaks down the creative process and the path to publishing in five chapters. In "The Art of Becoming an Author," Warner starts by making you think about your purpose. Why write a book? After penning your top five reasons, Brooke walks you through exercises that categorize your work, target your audience, and focus on the final product. Chapter two is devoted to six obstacles that may prevent you from reaching your writing goal. What I really enjoyed about this chapter were the exercises that forced me to confront what stands in my way and set new goals, free of excuses. My favorite chapter talks about building a solid platform. It's filled with honest and realistic approaches to handling social media, blogging, and communications. It's a must-read for any author! The final chapter builds a road map toward publication. Whether you're ready to shop your book to an agent or plan to pursue self-publishing, this chapter offers positives and negatives of both worlds. Straight forward, honest, and maybe even a bit eye-opening, I'm ready to tackle this project and end up with one of my books in my hand after reading Brooke Warner's What's Your Book? Brooke Warner is founder of Warner Coaching Inc., publisher of She Writes Press, and author of What's Your Book? A Step-by-Step Guide to Get You from Inspiration to Published Author. 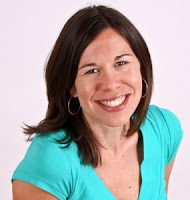 In her thirteen years in the publication industry, Brooke shepherded over 500 books through the publication process. Her expertise is in traditional and new publishing, and she is an equal advocate for publishing with a traditional house and self-publishing. We also have a copy to give away! 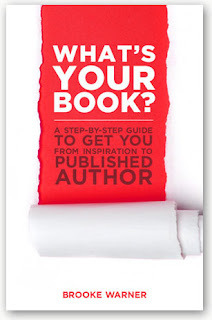 If you'd like to win a copy of What's Your Book? A Step-by-Step Guide To Get You From Inspiration to Published Author, enter the Rafflecopter form below. This book sounds great - I'm particularly interested in the various exercises. LuAnn--This sounds like a wonderful resource. And since my crashed and burned NaNo project is begging to be revived, I could probably put it to great use. I am excited to enter in the contest! And yes, I'm almost done with first novel! Looking forward to trying to get it published!